From its exuberant art and culture of multilingual ethnicity, astounding dance forms, mesmerising music, sophisticated heritage, zealous festivities, elegant clothing and delectable cuisine Karnataka has a plethora of historical secrets, interwoven within a rich and varied culture. It is a major tourist attraction with cities like Bangalore, the scenic Coorg, the lesser known hill town of Chikmagalur, and heritage sites like Hampi, which attract countless people every year. Karnataka offers a little something for everyone, be it a history enthusiast, a nature lover, or someone looking to immerse oneself in its cultural heritage. It is home to various tribes, the unique Siddi community, many Tibetan refugees, the anthropological enigma that is the Kodava community and others, who contribute to its own unique culture. Read on to know what makes Karnataka's culture stand out. Earlier, painting involved not only the act itself but the entire process, from making one's colours to watching as they come to life. Paper, wood, cloth, etc. were some of the materials artists used as a base for their paintings. Brushes weren't made from synthetic materials but were made from the original hair of animals like camels, goat, and squirrel. The Mysuru style of paintings usually are representations of legends, mythical scenes, and the royal family. This style of painting from Karnataka is known for its simplicity and intricate detailing across the country. The artists used a particular gesso paste, consisting of zinc oxide and gum, which formed a protective layer on the painting, which has kept them undamaged even after 150 years. Karnataka is home to 50 different tribes, each having their traditions and customs. Tribal art is another indigenous art form. Hase Chitra mud painting is an art form emerging from the Shimoga and Karwar districts and is currently being revived. Once home to the Vijayanagara Empire and four different dynasties that lasted for 300 years, Hampi now is a UNESCO World Heritage Site. The ruins of the Empire can be found in the form of temples, architectural marvels, the famous musical pillars, royal enclosures and scattered monuments. Hampi, housing these ancient ruins doesn't fail to attract abundant tourists every year. The Hazara Ram temple is a major attraction as it is believed to be there since Ram and Krishna's era. The rich history of Hampi is also displayed in the Archaeological Museum located in the town. Another popular attraction is the Mysore Palace. The architectural marvel is a combination of Indo-Saracenic style. The diversity of Karnataka isn't just in its art and history but also in religious and linguistic ethnicity. Combined with their long histories, the cultural heritage of the state lies in its language. The Kannadigas envelope most of the state that comprises 30 districts, while Karnataka is also home to Kodavas, Tuluvas, and Konkanis. Kannada is spoken as a native language by about 74% of the people of Karnataka. Kannadigas are the native speakers of Karnataka who form a dominant ethnic group. Being the administrative language of Karnataka, Kannada is considered as a classical language by the recommendations of linguistics experts and the government of India. The native speakers of Tulu called Tuluvas also form a dominant ethnic community of Karnataka. Tuluvas cover most of Dakshina Karnataka, Udupi, Kasargod of Kerala which is often termed as Tulu Nadu. The Tuluvas form 2.38% of the total population of Karnataka. The people who speak Konkani language are widely spread across Uttara Karnataka, Dakshina Karnataka and Udupi. In the region of Karwar taluk, Konkani speaker covers up to 78% of the population where a significant number of people are settled in Sirsi and Belgaum. According to the census of 1991, Konkani speakers are 1.78% of the population of Karnataka. Kodava language is probably one of the unheard languages of Karnataka with just 0.25% of native speakers. The Kodava people are settled in the Kodagu district of Karnataka. Apart from Kodavas, according to the Karnataka Kodava Sahitya Academy, there are 18 other ethnic groups who speak Kodava which includes Iri, Heggade, Banna, Koyava, Kembatti, Kudiya and Meda. The second largest ethnic group with 9.72% of the total population with majority speakers from Muslim community. Although the Urdu speakers are unevenly distributed in Karnataka, about 43.5 % are bilingual who prefer speaking Kannada rather than Urdu. The only state that flourishes with both Hindusthani music from North and Carnatic music from the south is Karnataka. The Hindustani musicians of Karnataka have won several awards like the Kalidas Sanman, Padma Vibhusan and Padma Bhusan. Hence, Karnataka has achieved a prominent place in Hindusthani Music. Basavaraj Rajguru, Puttaraj Gawai, Sawai Gandharva are some famous performers to name a few. Purandara Dasa is one of the prominent composers in Karnataka who composed close to 75,000- 745,000 songs in Kannada and Sanskrit. Owing to his contribution, he is considered as the Father of Carnatic Music. He became a source of inspiration to composers like Tyagaraja. Purandaradasa later laid down a framework to impart the knowledge of Carnatic music. Considered a difficult art form, Yakshagana lacks a written script and depends entirely on the artist's ability to be spontaneous, to improvise, to be a good orator and have a sound knowledge of the plot and character. The unique art form of Yakshagana has various elements like dance (Nrithya), makeup (Bannagarike or Mukhavarnike), background singing and direction (Bhagvathike), two forms of drums (Chande Maddale) and conversation (Arthagarike). The art form is 500 years old, and the entire portrayal takes place in refined Kannada, without even a word of any other language. It is an important tradition and also a prevalent art form. Siddi community's Dammami dance is also another traditional dance form. This dance form derives its name from an instrument Damam, made from leather. Initially, the dance was performed by Siddis post hunting to honour the tribal God Siddhinas. However, as the activity itself is banned, the dance is now performed once a year for the whole night. The performances are done in the Konkani language and depict a story, usually about the hunt or farming activities like ploughing, harvesting, etc. The recent uproar over Tamil Nadu's bull-taming festival of Jallikattu has drawn attention to Karnataka's Buffalo race called Kambala. 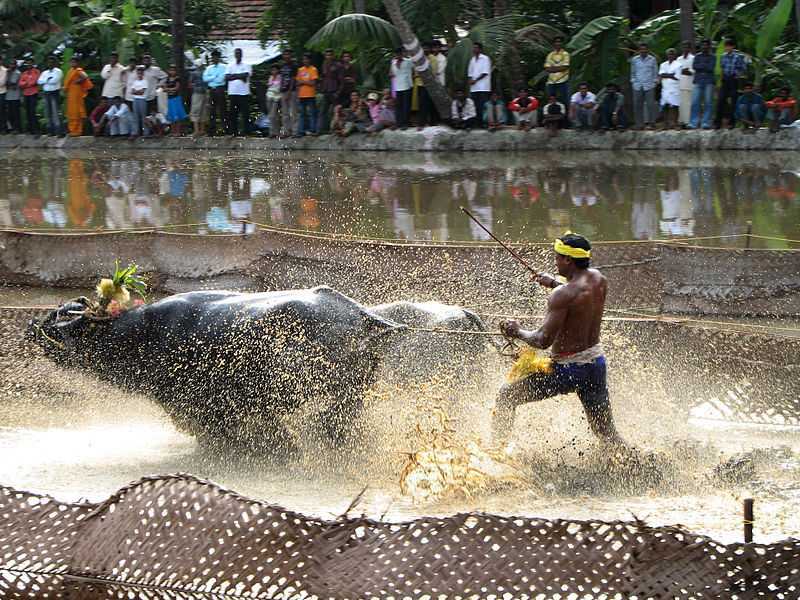 The annual buffalo race, a two-day festival, is an integral part of the rural community and is considered a sport as well as a tradition. Earlier, the rewards used to be coconuts, but these have been replaced by medals in the recent times. The festival can be traced back over 800 years and is celebrated to please Lord Kadri Manjunatha, an incarnation of Lord Shiva. In the last few years, it has received a lot of backlash from organisations concerned about animal cruelty. However, the recent judgement by the Supreme Court has allowed the celebration of this annual festival. The other main festivals of Karnataka are Ugadi, the Kannada new year, and Mysuru Dasara, or popularly known as Navratri, a ten-day festival in honour of the Hindu goddess Chamundeshwari which can be traced back to 15th century. Nearly half of the workforce in Karnataka is engaged in traditional agriculture and related activities. The remaining people of the community, however, indulge in various public, private sectors and performance arts. The heart of the State, Bangalore is nicknamed as the 'Silicon City' for the booming IT industry. Weddings in Karnataka follow customs similar to Traditional Hindu Weddings. The first ritual happens to be Nandi Puja followed by a fascinating ritual of Kashi Yatra takes place, where the groom pretends to go on a pilgrimage saying that the family doesn't find a bride for him. The groom is appeased by his uncle at the end of the Kashi Yatre and then Dev Karya takes place in front of Lord Ganesha ending the prewedding rituals. The Wedding starts with the Mandap(Mantap) Puja to cleanse the venue followed by the Var Puja and the Dhare ceremony. The most important part of every wedding is the Sapthapadi where the bride and groom walk around in a circle with the holy fire at the centre of it seven times while chanting the Vows of Marriage. The wedding concludes with the groom tieing the Mangalsutra around the bride's neck. Post wedding games are the fun part of every wedding where the families and friend from both sides take part actively. After the celebrations and games are the most heart touching moments for the festivities when the bride has to say bye to her parents and tears rolling down the cheeks is a normal scenario in these moments. The bride is welcomed to the groom's house with the Griha Pravesha ritual calling an end to the ceremonies and marking the start of a happy life together. In Karnataka, the attires vary from district to district as it is home to various communities. The Kodava people, believed to be the direct descendants of Alexander the Great, have a distinct traditional attire which acts as an immediate differentiator. Ilkal sarees are one of the popular traditional attires of women in Karnataka. Traditionally worn by women in the rural area, Ilkal sarees have now caught the attention of the entire country. Ilkal sarees are named after a town by the same name in Bagalkot district of Karnataka. 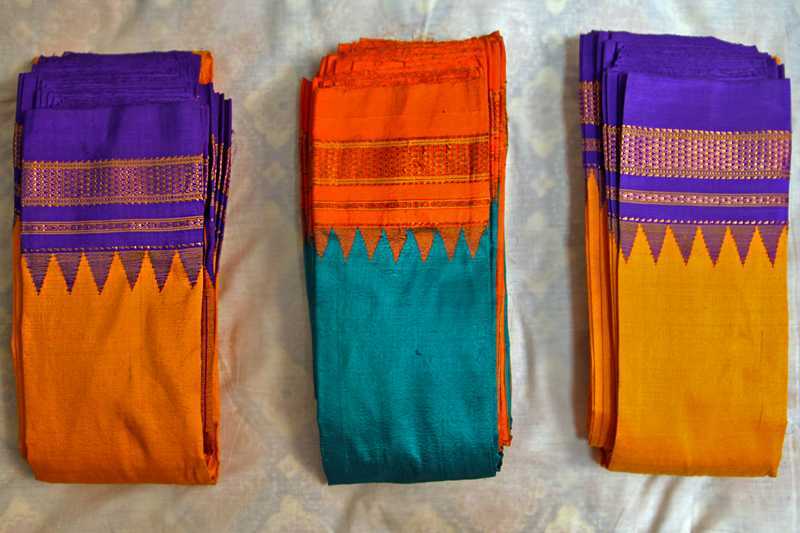 These are now sought after by saree lovers across the nation due to the unique process by which they are woven. They are made using a different looping process known as Tope Teni. This 8th-century method is entirely undertaken by the weaver himself, without the use of machines. The sarees are hand woven and are in high demand by the locals during the wedding season. Karnataka is known for its wide variety dosas and sambar. The food is rich in flavour and consists of various vegetarian and non-vegetarian dishes. 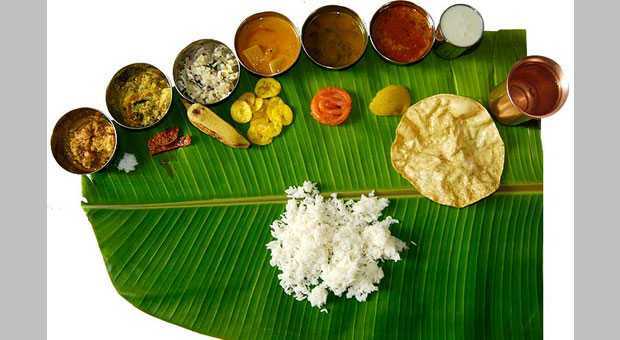 However, a typical Kannadiga Oota (meal) consists of rice, sambar, pickle, ghee, dessert, and other curry based dishes and is served on a banana leaf. Other popular dishes include the super light Neer dosa, Bisi Bele Bhaat which is a lot like a khichdi, and chicken curry known as Korri Gassi. Coconut and fruits are a staple element of these dishes. A signature dish of South Karnataka is the kori rotti. It consists of a thin wafer-like rotti made from rice, dipped in chicken curry. This is the traditional dish of the Tuluvas. Mangalorean fish curry is one of the many popular dishes that are an intricate part of Karnataka's cuisine. The gassi is made in redfish or prawn curry or kori roti, another popular dish of Udupi cuisine. Coconut paste is an important element of the dish, and the curry itself is made up of versions of milder curries. Mangalore is a port city; fish is a staple diet for many people. It has beautiful coasts and streets lined with palm trees and was also a major seaport during the reign of Tipu Sultan. Karnataka is a fascinating place to visit. Every town or city of Karnataka has something different to offer. This southern state of India has a vast culture and is a great place to visit alone, or with friends or family. It offers variety in its culture, art form, food, and has such a rich history. It truly showcases India's diversity. Camping Sites Near Bangalore - For A Perfect Getaway!